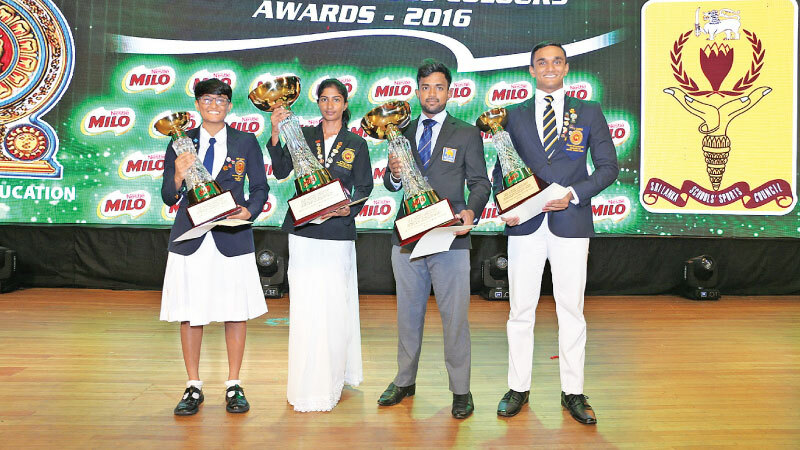 The Sri Lanka Schools Milo Colours Awards 2016 and 2017 was concluded on a high note at the Bandaranaike Memorial International Conference Hall (BMICH) yesterday where the schools sporting talent in the country was felicitated. Five hundred and nineteen students representing 30 sports were awarded Colours for 2016. State Minister of Education Vijayakala Maheshwaran participated as the chief guest of the morning session where the 2016 awards were presented and Education Minister Akhila Viraj Kariyawasam was the chief guest at the evening session where the 2017 awards were presented. The event is considered the apex annual sports award ceremony for the school fraternity and most of the top award winners went have gone on to win national and international accolades over the years. Cricketer Charith Asalanka of Richmond College, Galle was adjudged the Most Outstanding Sportsman for 2016 and athlete Omaya Udayangani of Welimada Central College was awarded the Most Outstanding Sportswoman award for the same year. Swimmer Akalanka Peiris of St. Peter's College, Bambalapitiya bagged the Emerging Sportsman award for 2016 and swimmer Ramindu Samarakoon of Visakha Vidyalaya was picked as the Emerging Sportswoman of 2016. 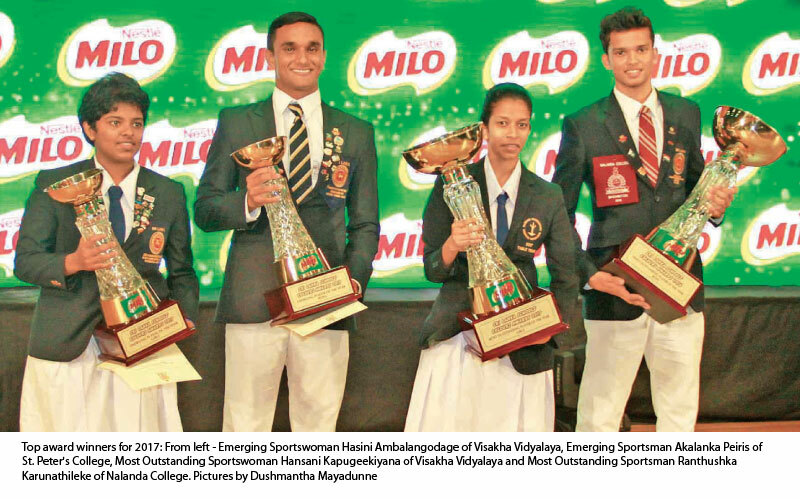 Shuttling star Ranthushka Karunathileke of Nalanda College, Colombo was adjudged the Most Outstanding Sportsman for 2017 and table tennis player Hansani Kapugeekiyana of Visakha Vidyalaya was awarded as the Most Outstanding Sportswoman for the same year. Swimmer Akalanka Peiris was picked as the Emerging Sportsman for 2017 and shuttling ace Hasini Ambalangodage of Visakha Vidyalaya was awarded as 2017 Emerging Sportswoman.